Every child knows to leave a plate of milk and cookies out for Santa Claus, but this season of giving, it might be time to expand your scope. There are plenty of men who live in deer-filled workshops you can leave milk and cookies out for! Thanks to his massive wealth, reclusive billionaire Patrick Holland has been able to fill his sprawling, opulent workshop with beautiful deer from around the world: elegant Sika deer from Japan, tiny dik-diks from Africa, and hearty Scandinavian moose. When he’s not crafting intricate jet and ivory chess pieces for his heated matches against himself, Patrick enjoys feeding the deer bits of marzipan and chasing them around for aerobic exercise. Unfortunately, the unfamiliar habitat and confusing pheromones from dozens of different deer species have made the deer in his home disoriented, aggressive, and territorial, forcing Patrick to wear custom-made kevlar “deer armor” at all times to withstand their kicks and bites. You can certainly leave milk and cookies out for Patrick Holland, if you want. When the deer all go into heat simultaneously he takes days-long walks, and thanks to his lack of social graces, he’s happy to eat anything off someone’s porch if it looks appetizing, milk and cookies included. All woodland creatures have a home in Christopher Pinetree’s tinker shop, where he works stout pewterwood from the heart of the forest into fine hand-carved tools to sell at market. A gentle soul, Christopher Pinetree lives peacefully in his workshop alongside a large family of white-tailed deer, which he forages alongside for root vegetables and edible mushrooms, and huddles with for warmth on the coldest nights. If you’d like to leave milk and cookies out for Christopher Pinetree, your best bet is to drop them off in a forest clearing, where he may find them on one of his roaming rambles. Christopher Pinetree mostly drinks deer milk, so cow’s milk would be a refreshing treat for him. 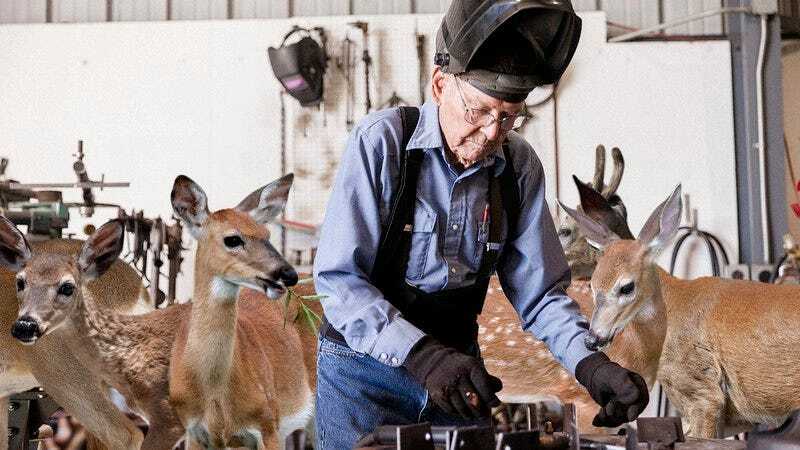 Dr. Kreiss spends his days hard at work fitting deer parts together in ways yet undreamed of, and his nights dreaming up grand new deer designs. His workshop holds hundreds of deer in various stages of sedation, dismemberment, and reconstruction, including his prized 30-legged doe-a-pede and the incredible one-of-a-kind deer head on a leg. You’re more than welcome to leave some milk and cookies out for him, though he rarely leaves his sprawling underground workshop, except to scrape blockage out of the deer slurry grate and to inspect his chute traps to ensure a steady deer supply. You may want to put out some Purell next to the platter so Bernhard doesn’t contaminate them with deer viscera. This year, though, Dr. Kreiss is working around the clock trying to finally create an elegant long-necked deer-affe, so if your cookies and milk go unconsumed, don’t be offended. The Deer Man had a name once, but now he’s just the Deer Man. With his long graceful limbs and dull, frightened eyes, the Deer Man is almost indistinguishable from the pack of deer he lives alongside when they’re running at a full gallop. The Deer Man makes his home in an abandoned canning factory, and he exerts such a powerful pheromonal pull over the deer that root around there that he turned normally solitary animals into a loyal pack which treats him as one of its own and runs with him through the night. The Deer Man and his pack are always ravenous from running and running, so they’ll happily chow down on any milk and cookies they encounter on your lawn or yard. But never, ever follow the Deer Man. There’s always room in his pack for one more. As Santa Claus’s nephew and longtime intern, Harold is an integral part of Santa’s whole operation. When he’s not tidying up the reindeer stables where he sleeps, Harold serves as a test subject for the potions and chemical baths that the elves make to keep Santa immortal and jolly, which over the decades has made Harold a walking carnival of skin rashes and pustules. When it’s time to deliver gifts to the children of the world, an increasingly paranoid Santa has taken to bringing Harold along as his food tester to ensure that nobody successfully poisons Santa Claus. Feel free to leave milk and cookies out for when Harold Claus climbs in through your bathroom window, but don’t label them as such, or Santa might fly into a jealous rage and beat him severely. Make sure they’re extra-soft cookies, too, since years of experimentation have fused Harold’s teeth into a pair of top and bottom tooth slabs that don’t chew too well.